Congregate was formed early in the summer of 2017 to respond to the need people felt to confront hate and injustice. Congregate organizes and equips faith leaders and those who would follow them with resources and skills to show up for justice. With the leadership of Rev. Brittany Caine-Conley, co-founder and lead organizer of Congregate C’ville, and Rev. Seth Wispelwey, Directing Minister of Restoration Village Arts (RVA), a national clergy call was organized and training in nonviolent direct action coordinated in the months leading up to themassive white supremacist rally on August 12 in Charlottesville, VA. 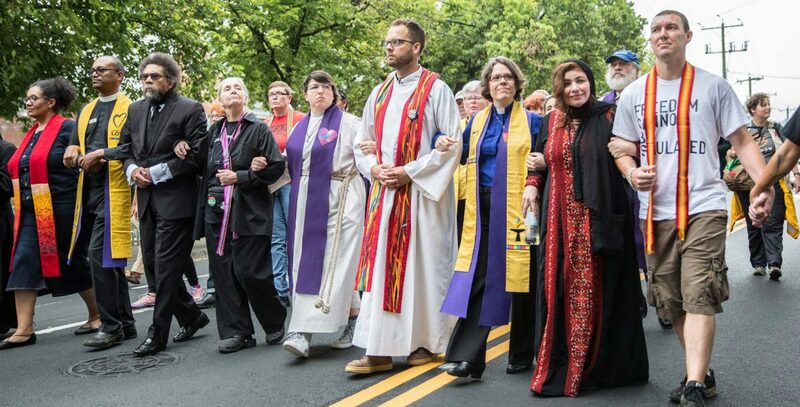 Responding to the acute pastoral concerns and prophetic call surfaced by violent, dehumanizing white supremacy, Restoration Village Arts helped lead the mobilization of hundreds of multi-faith clergy, leaders, academics, and people young and old here and from around the country. In building Congregate, we developed and provided trainings, safe spaces, services, resources, public actions and profound earned media outcomes that enabled a profound, concrete spiritual impact during a traumatic series of events last summer. Congregate is now established as an independent entity and Restoration Village Arts continues its work alongside Congregate in Charlottesville. You can read much more and register to come at CongregateCville.com.